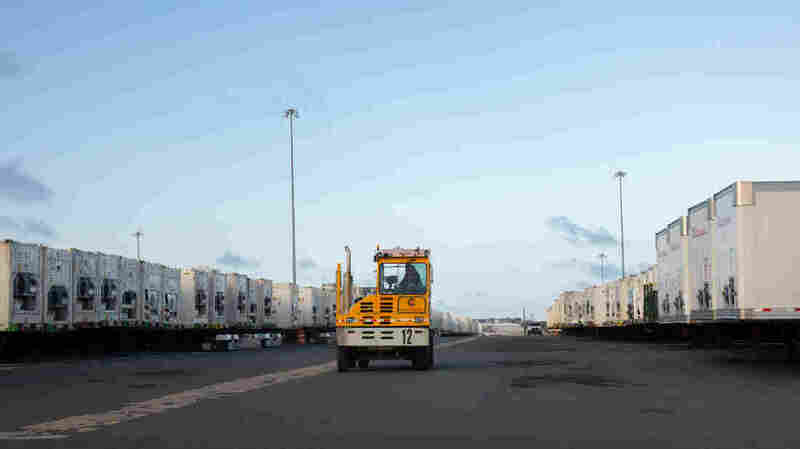 In Puerto Rico, Containers Full Of Goods Sit Undistributed At Ports : The Two-Way Authorities say truck drivers to move the food, water, medicine and other items around the island are scarce, as is diesel. Whether roads are too damaged is disputed. Crates are stacking up. 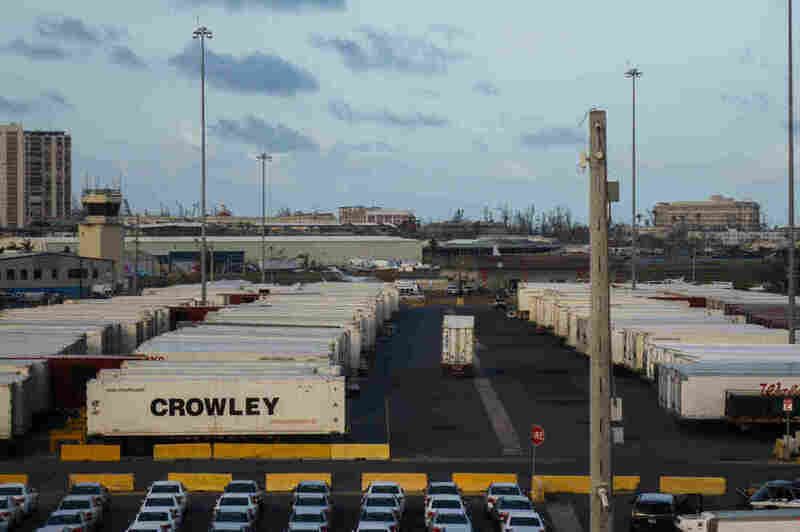 Crowley shipping containers with running refrigeration systems are lined up at in the port of San Juan, Puerto Rico. They've been there for days, goods locked away inside. Millions of people in Puerto Rico need fuel, water, food and medicine. More than a week after Hurricane Maria devastated the island, major infrastructure is still down. Stores have trouble filling their shelves. Families are running low on the supplies they stockpiled before the storm, and across the island, many residents say they haven't seen any aid deliveries. Meanwhile, at the port in San Juan, row after row of refrigerated shipping containers sit humming. They've been there for days, goods locked away inside. It's one thing to get supplies to Puerto Rico. But officials at the Department of Homeland Security, which administers FEMA, say moving goods around the island is the bigger challenge. These containers were brought to the island by Crowley, a maritime shipping company. The company started unloading shipments on Saturday. By Friday, it will have received more than 4,000 loaded crates. Most of the containers coming in have never left. 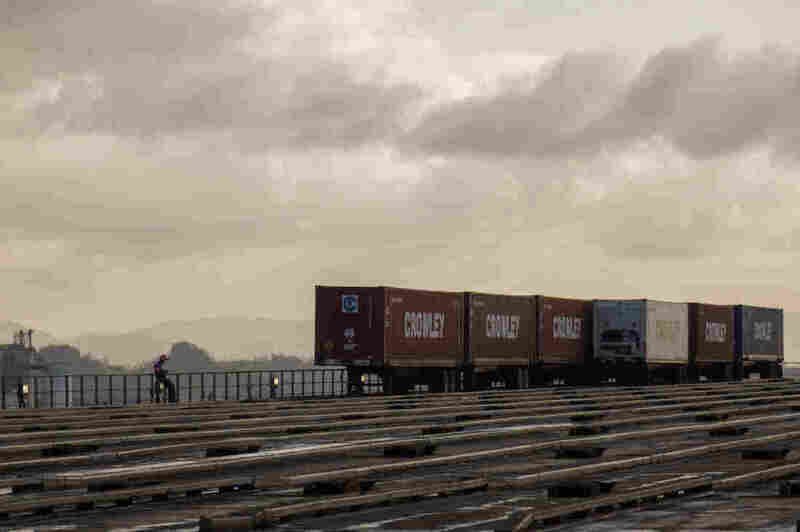 Crowley says it has more than 3,400 commercial containers at its terminal now. That's just one shipping company, at one port. Several other ports are accepting shipments, and stranded crates total an estimated 10,000. "These containers are full of food, these containers are full of water, full of medicine ... full of construction materials," says Vice President Jose Ayala, who notes a barge a day has arrived since the port opened on Saturday. "It has reached Puerto Rico. The problem is we can't get it on the shelves." Hundreds of refrigerated containers here posing an extra problem. Stores without fuel for their generators can't accept goods that need to be kept cool. The Puerto Rico Federal Affairs Administration tells NPR that the government is working with the truck driver's union to find a solution for driving with downed power lines and damaged roads, and the Department of Defense says it has sent teams to work on clearing blocked streets. He says more than 5,000 homes were completely destroyed in his town, and people are running out of water and insulin. But aid and resources, "they're staying in San Juan," he says. Kurtz was in San Juan to ask for help, and having made the trip himself, he doesn't believe that road conditions are an obstacle. "The roads are open," he says. "I've been able to come here. So why haven't we used this to [transport goods] west?" Meanwhile Juan Carlos Garcia, the mayor of Coamo in the south of the island, says the only aid his town has received is five pallets of water. "The state never came to provide diesel to the hospital," he says. People are running low on food supplies and hysteria is growing, he says. He, too, says the roads are clear — and that he's in San Juan to ask why no aid has reached his town. Along with road conditions, authorities and shipping firms also say diesel shortages are to blame. Long lines for gas are persistent all over the island. Distributing fuel across Puerto Rico is FEMA's number one priority, the Department of Defense says, to help alleviate the issue. 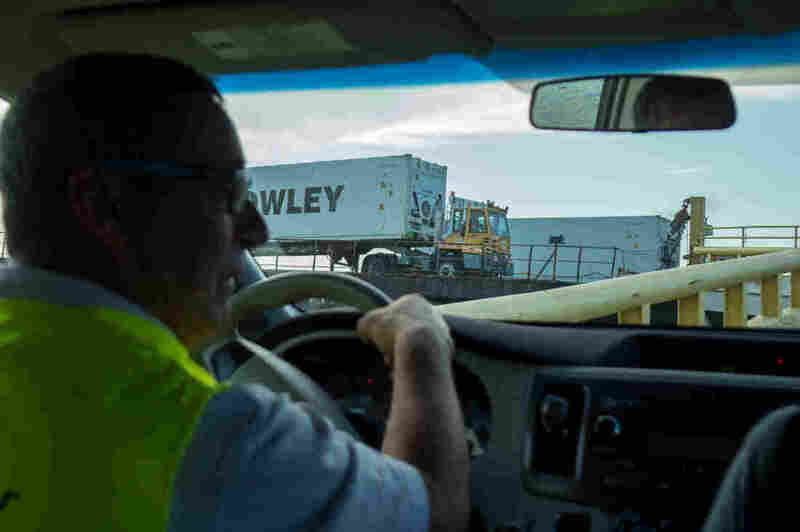 You have a shortage of drivers who have lost a lot during the storm," he says. "You may have a huge fleet but they ain't moving themselves." "Whatever driver shows up, we put him to work," he says. Delivering goods by air isn't an automatic solution either, says Nino Correa, the director of search and rescue for Puerto Rico. He's also been tasked with coordinating drops of food and water from helicopters to aid stranded residents. "It's difficult because of the make-up of our island," he says. "It's very mountainous and it's very dangerous for air operations to be taken to certain places," he says — risky not just for the air crew, but for people on the ground. "This is the first time in our island that we have received a hurricane that has impacted us like this," he says. "And we know that if life is difficult during an emergency, during a disaster it's a lot more difficult. "We're working very hard for this," he says. "There are a lot of people working hard to build [Puerto Rico] back up."